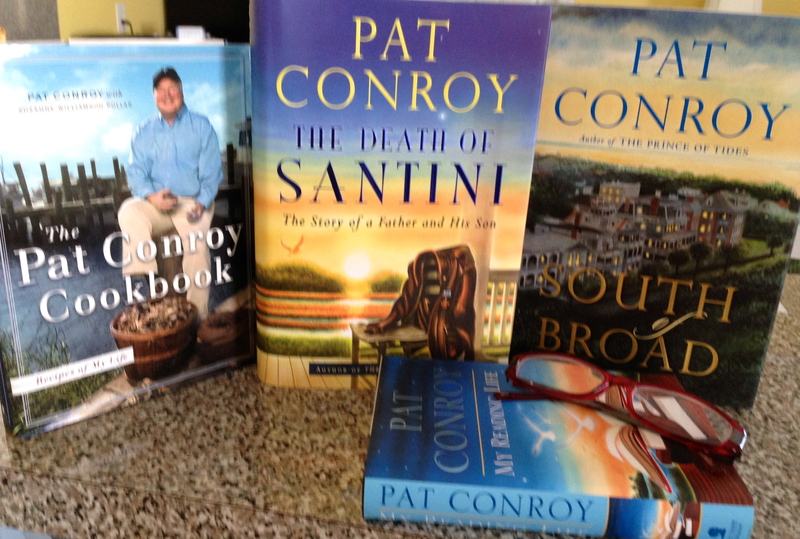 I have pulled from my bookshelf four favorite Pat Conroy books. There is never a lack of interest or reviews when Pat Conroy publishes another book. I must add my own personal tribute to his extraordinary gift of writing. His latest, The Death of Santini, the final letting go of his father and mother, is a witness to the power of love and forgiveness seldom seen. Which page would you like to turn to discuss, it is that rich with story and description, emotion and humor. It is Conroy’s sense of place that always fills me with awe and the desire to be present in my own surroundings as he is to his. It is the rise and fall of the tides in his life that create the background for his writing. I will never forget the prologue to South of Broad. “I carry the delicate porcelain beauty of Charleston like the hinged shell of some soft-tissued mollusk. My soul is peninsula shaped and sun-hardened and river-swollen.” This is the second paragraph of the opening chapter that leads you on to the cobble stone streets and the smells of an early Charleston morning. After dinner parties, I have read countless times to company, the hilarious section – Vadalia Onions- from his cookbook, Recipes of my Life. He tells the story of accompany his friend, Knox Dobbins, to the Georgia-Tennessee football game and sitting next to a little old lady who barks throughout the game….Arf, arf, arf. This is a laugh out loud tale. The recipes are laced throughout with wonderful stories like this that make the cookbook an unexpected treasure. My Reading Life is meant for all who love to read, written by an addicted reader who weaves stories around his reading life. A small volume full of information and charm. This was my favorite Conroy book, well, that is, until I read the next one. The gift of language like poetry, his desperate love of family that has wounded and shaped him, an amazing intelligence, are but a few things that make Pat Conroy a favorite writer of mine. I feel he has spread his soul thin by now trying to write an exquisite sentence that is filled with healing, wisdom, unbearable sadness, and yes, charm. This entry was posted in A Writer's Writer and tagged Book Reviews, My Reading Life, Pat Conroy, Recipes of Life, South of Broad, The Death of Santini. Bookmark the permalink.